Most pupils, however, came from wealthy families who paid tuition. Only twelve slots were reserved for poor students. These children were given paper, a pen and ink, two sets of outdoor clothing, and even firewood. Despite this, the South Carolina Gazette reported in January of 1760 that only 10 of the 12 slots had been filled. The first location of the school is unclear. The Winyah Indigo Society built a large brick hall in 1857, which still stands downtown today. The hall is said to have replaced an earlier structure. When the Winyah Indigo Society Hall was completed, the school met in the new building; however, just a few years later, the Civil War erupted. The school closed when Union troops used the hall as a hospital. It reopened in 1872, and by 1885 the Winyah Indigo School District was created. In 1887 Winyah Indigo School merged with another public school, and the combined school continued to meet in the society’s hall. In 1907 land was purchased for the construction of a separate school building, and by 1908 the two-story building opened. It was built by the architectural firm headed by Hartsville native Charles Coker Wilson, who designed many notable buildings throughout South Carolina, including the State House. The school initially served students through the tenth grade, adding the eleventh grade in 1912. The area’s population grew, and the upper grades were moved to the former Georgetown Hospital in 1919. In 1924 an addition to the school was built to accommodate the growing student body; the original building and the addition are connected by an auditorium, which was enlarged during the building project. A new high school was built next to the Winyah School, as it came to be known, in 1938. The original Winyah school building remained in use by the school, however, until 1985; Coastal Carolina University in Conway also utilized the 1924 addition for a number of years. In 1985, Georgetown High School was organized and located elsewhere, and the building was given to Georgetown County. 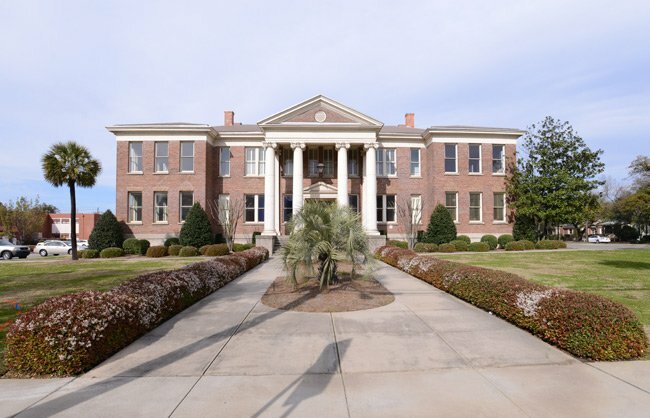 Coastal Carolina University continued to use part of the building while the county and preservation groups worked to find other uses for the historic school. Today the building, including the original school, the auditorium, and the 1924 addition, houses several entities: the Georgetown School of the Arts and Sciences, a private college preparatory school; the Lowcountry Conservatory of Music; Coastal Optical; and Coastal Eye Group. (Winyah Graded & High School; Old Winyah School; Georgetown Graded & High School) The Winyah Indigo School is comprised of a 1908 graded school and auditorium, and a ca. 1924 auditorium extension and high school addition to the rear. It was constructed in the Classical Revival style. Significant as a design of the prominent Columbia, SC firm of Wilson, Sompayrac and Urquhart, the 1908 school was built by John Jefferson Cain, contractor, also of Columbia. David B. Hyer, an architect from Charleston, designed the 1924 high school building, which was built by the Cheves-Oliver Construction Company, also of Charleston. An important landmark in Georgetown, this school was built on what had historically been a commons area for the townspeople. It is one of the few, surviving, relatively intact early twentieth century brick school buildings in Georgetown County. The entire masonry building rests on a raised masonry and concrete foundation. The foundation is separated from the exterior brick walls by a concrete stringcourse. The low hip roof of the building is covered with asbestos shingles. A full basement is located beneath the grade school. The auditorium links the graded school and the high school.